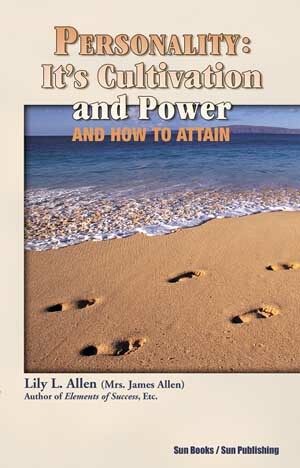 Personality: Its Cultivation and Power and How to Attain by Lily L. Allen. Personality, Right Belief, Self-Knowledge, Intuition, Decision and Promptness, Self-Trust, Thoroughness, Manners, Physical Culture, Mental, Moral, and Spiritual Culture, Introspection, Emancipation, Self-Development, Self-Control and Mental Poise, Liberty, Transformation, Balance, Meditation and Concentration. 170 pages. 5x8. Paperback. ISBN: 0-89540-218-1. $18.00.